Soap & Bath Wedding Favors! In this section you will find whimsical soap designs that will delight your guests! These soap favors are both fun and practical! Not only would they make great wedding favors, they are great gifts for the bride. Confetti bubble bath, state shaped soaps, animal shaped soaps, alphabet shaped soaps, and other bath favors can be found right here! 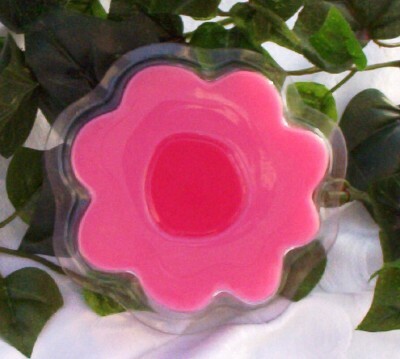 These really cute garden flower soaps are already packaged in a plastic container. Just open the case and pop the soap out. You can actually use the container as a soap dish. The garden flower soap is lightly floral scented. Perfect for traveling. Great bridal shower favor. 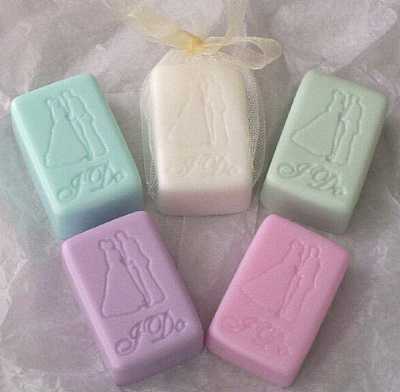 These "I Do" soap bars are perfect favors for weddings, bridal showers, and engagement parties. They are also great for save the date announcements. Each bar measures, 2" x 3" x 1.25"D. Pink - Strawberry Champagne, Blue - Clean Cotton, Cream - Warm Vanilla Sugar, Green - Sweet Pea, Lavender - Lavender scents. Each is shrink wrapped. You can add a cello bag tied with ribbon or organza wrapped tied with ribbon. If you are offering them in a gift basket along with other items, you can keep the cost down by just having them shrink wrapped. If your client is looking for a finished favor, you can choose the cello bag or organza bag. Price is per bar. Minimum order is 2 bars. 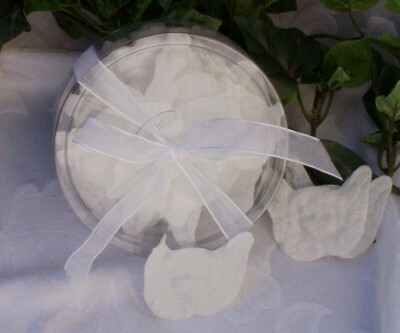 Angel soap confetti is perfect for the couple "made in heaven". These make great holiday themed wedding favors or bridal shower favors. The angel soap confetti is actually perfect at any time. Each clear round container has ~30 white chamomile scented angel soap confetti. These are great to use to decorate tables. Just sprinkle on the table and it will create a nice aroma. You can have little favor boxes or bags and just have the guests to take them home. Price is per container. 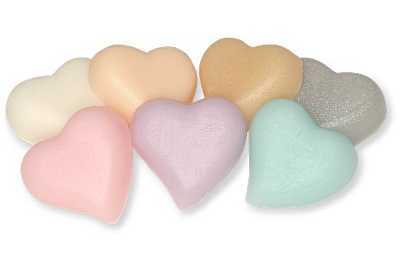 Bath Caviar Favors These mini heart shaped containers hold 60 grams of green tea scented bath caviar. Available in pink, aqua and white. Price is per set of 4 bath caviar favors. Minimum order is 3 sets. 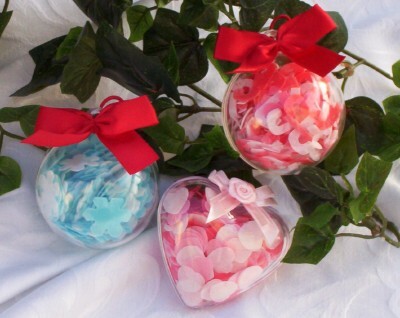 These really cute confetti ornaments are perfect for holiday favors and gifts. The confetti ornaments are filled with confetti bubble bath. Each ornament is made of clear plastic and has a cute accent bow. Price is per confetti ornament. Minimum order is 3. Each ornament is ~ 2"D.
These really cute bath fizzers are perfect for beach wedding favors. Each beach bath fizzer can be packaged in an organza bag, otherwise they are just shrink wrapped. Prices for each shape is different. Prices are listed in the drop down box for choosing shape. Price is not $0. Colors will be as pictured. All are lightly ocean scented. Price is per beach bath fizzer. Minimum order is 3. These really cute glycerin bunny soaps are perfect for any baby shower! These 3" square freesia scented bunny soaps are individually shrink wrapped. 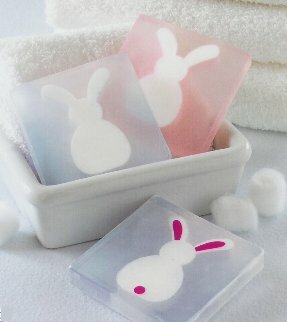 The bunny soaps make great baby shower favors, kid's party favors, or Easter and spring gifts. This full size butterfly soap bar is lovely. 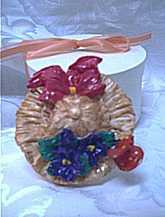 The butterfly soap will make a great bridal shower favor or garden wedding favor. 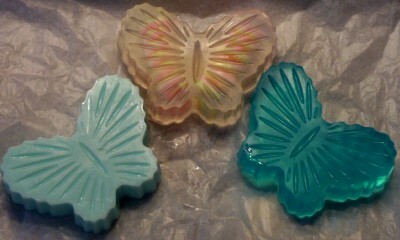 The butterfly soap measures ~ 4" x 3" and weighs 4.5 oz. We can make them 3 different ways. Opaque, clear, or clear with embeds. All are lovely. Packaged in a cello bag and tied with a ribbon. Price is per butterfly soap. 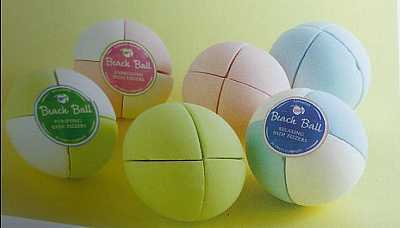 Ingredients: glycerin soap, cosmetic colorants, fragrance oil. This really great smelling chic soap is perfect for your girlfriends and for you! 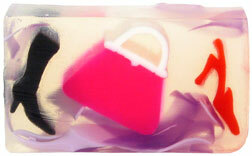 The chic soap features everything a girl really wants, purses and shoes. The chic soap is made of 100% glycerin. Each bar is 1" thick and weighs ~7.3oz. It has a lotus melon scent. The price is per bar of chic soap. Conversation heart bath foam is the cutest gift for someone else or yourself. 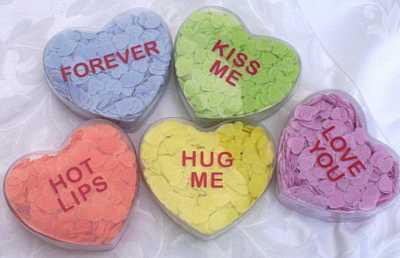 Each conversation heart is filled with a bath gel that makes a fragrant bath foam when put under running water. 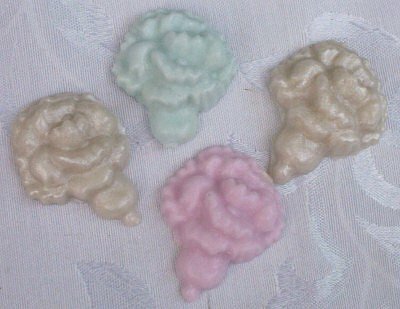 There are six styles of conversation heart bath foam in a set. The set consists of Hug Me (lemon, yellow), Kiss Me (apple, green), Be Mine (Mixed Berry, lavender), Forever (blueberry, blue), Love You (strawberry, pink), and Hot Lips (mango, orange). They are ~3"L and contain 120 ml of bath foam. 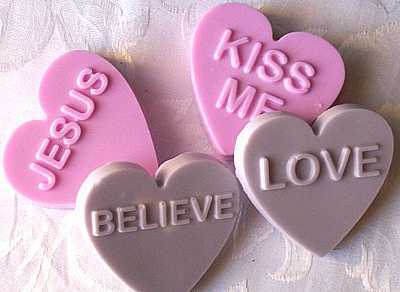 These are perfect for kid's wedding and party favors, bridal shower favors, baby shower favors, and love themed favors. 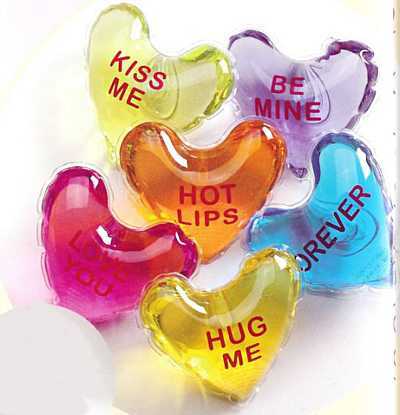 Price is for a set of 6 assorted conversation heart bath foam. Country Hat Soap These are very detailed beautiful country hat soaps. They weigh 5 ounces and is 3 1/4" in diameter. This hat features a big bow, a butterfly and flowers. This is a must have for any bathroom. The hat featured is hand painted with soap paint. Soap paint will last several uses and is harmless. This soap is made from 100% coconut glycerin, fragrance, and colorants. You can get them fragrance free and unpainted. They are packaged in a "hat box", just in case you decide to give it as a gift. This really great smelling dress soap is perfect for your girlfriends and for you! 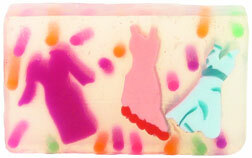 The dress soap is made of 100% glycerin. Each bar is 1" thick and weighs ~7.3oz. It has a floral scent. The price is per bar of dress soap. 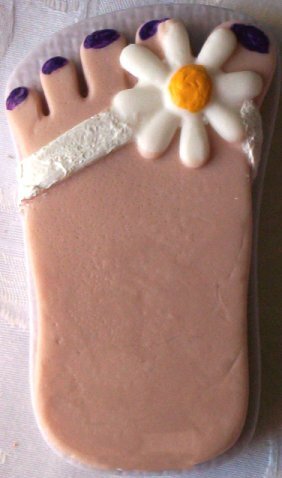 Flip Flop Sandal Soap These cute flip flop soaps feature a daisy and a foot! The nails are even painted! How cute! You can choose the sandal color, the scent, and even the skin tone. Made with pure vegetable glycerin. Flip Flop Sandals Funsoaps These cute 3-D flip flop sandals soaps are really cute. These will make great flip flop favors for your next beach themed event. The straps are raised giving these glycerin soaps are really unique and beautiful look. There are 3 colors to choose from. They are sold as a pair. Price is for the pair of soap. 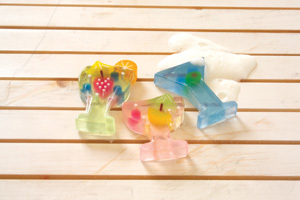 Gift boxed 4.75"
Flip Flop Soap These are perfect for your beach themed wedding or a pool party! They resemble and old time favorite, flip flops. They are sold in pairs. They come in several different colors. You can mix colors in increments of 6. 1"H x 3-1/4"L x 1-1/4"W. 1 week lead time The prices are listed in the quantity prices drop down box. 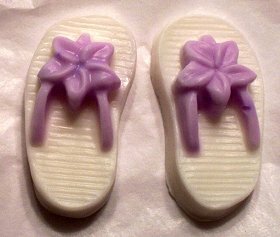 This really great smelling flip flop soap is perfect for your beach wedding favors! 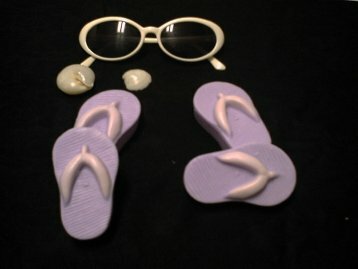 The flip flop soap features flip flops. The flip flop soap is made of 100% glycerin. Each bar is 1" thick and weighs ~7.3oz. It has a vanilla, melon, floral and fresh citrus scent. The price is per bar of flip flop soap. 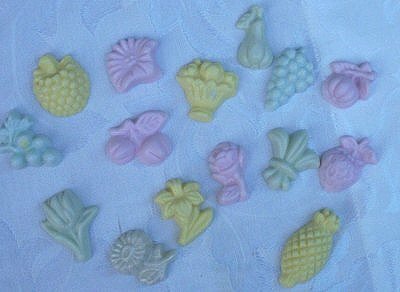 Floral & Fruit Mini Soap Assortment These cute mini fruit and floral assorted soaps are perfect for shower favors or wedding favors. They also make great hotel guest gifts. Each set contains 25 assorted mini soaps. Price is per set of 25 mini soaps. Floral Bouquet Mini Soaps These floral bouquet mini soaps are great for bridal showers or hotel guests gifts. They are ~1". The price is per bag of 10. Lightly floral scented. 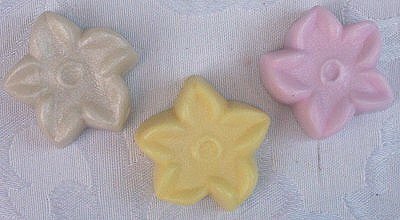 Flower Mini Soaps These flower mini soaps are great for bridal showers or hotel guests gifts. They are ~1". The price is per bag of 10. Lightly floral scented. 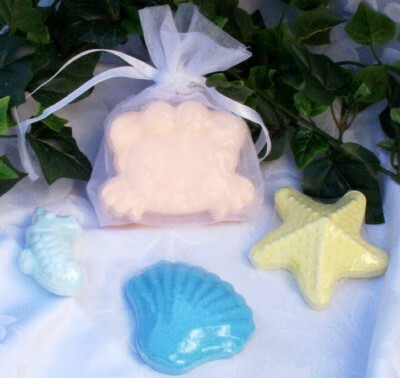 These really cute footprints in the sand soaps make great beach wedding favors. They are really unique. The footprints in the sand soaps can be personalized with initials. Each footprints soap measures ~ 3.5" x 2" x 1". The footprints soaps are packaged in a cellophane bag and tied with a twist tie. 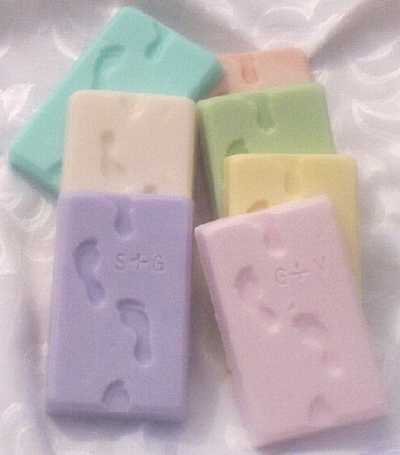 The footprints soaps are lightly scented. Price is per footprints soap. If you are personalizing the soaps, put your initials in the comment field below. 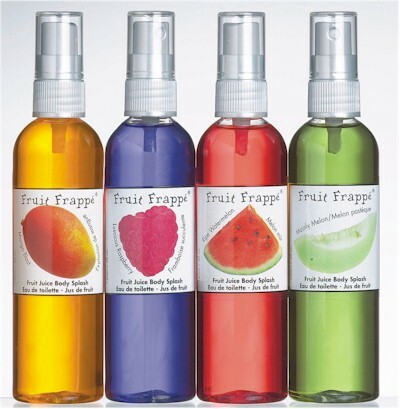 Our fruit juice body splash smells wonderful! It is infused with real fruit juice. The fruit juice body splash comes in 4 wonderful flavors, juicy watermelon, vine ripe raspberry, sweet honeydew melon, and delicious mango. These also make great gifts for baby showers and bridal showers. This category has a total of 91 products divided in 28 per page.